Privacy is everything these days. We’re almost all worrying about what companies have what information about us and if they’re storing it safely. Microsoft got attacked from all sides when they first released Windows 10 because they included extensive privacy controls. This didn’t mean that Microsoft were suddenly accessing all your private information, it just meant they were the first company to highlight it. Now, in the wake of the Facebook / Cambridge Analytica scandal every tech company is taking privacy seriously. 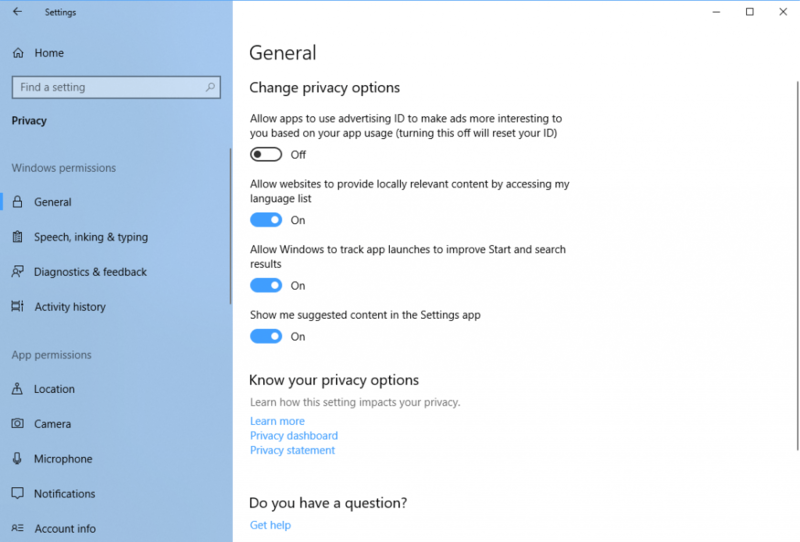 You can get a lot of control over your privacy in Windows 10 in Settings > Privacy but there are so many options it can seem daunting. The Privacy settings are split into two main sections however that can make it easier to manage your personal privacy settings. Windows permissions contains all the main privacy settings associated with your PC. This includes advertising permissions, search, your activity history (which is used for services such as Windows Timeline, and diagnostic information. You can deactivate everything except very basic diagnostic data that’s used by Windows Update to determine what security and stability patches your PC needs. App permissions display all the different permission types allowed for your installed apps, such as accessing your camera, microphone, and location. Win32 desktop PC software can’t have its privacy managed in this way, but here you can view and manage the privacy for every app that’s been installed through the store, including Win32 software such as Microsoft Office that is delivered this way. Overall the privacy controls provided by Microsoft might be extensive, even confusing at times, but it can be well worth spending some time browsing the options available if you want to keep your own personal data, to yourself.